Plus AudioMate Set, so you can learn on the go! This software program is very easy to use with simple, intuitive and clear navigation, making learning an enjoyable and rewarding experience. You can used it by yourself as a personal study course, or use it to supplement any level of English language study. Lessons For Life - English develops the skills you need to optimize your TOEFL/TOEFL IBT, TOEIC/TOEIC IBT, EILTS scores and succeed in education and business. 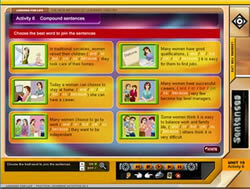 English skills include: reading, writing, listening, spelling, dictation, speaking, vocabulary, grammar, and culture. Learn on the Go with AudioMate! 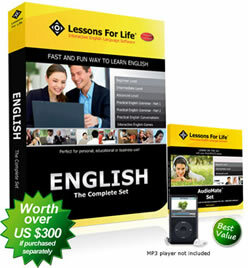 Now you can learn English while you are travelling! 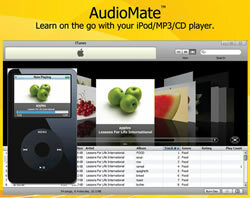 AudioMate is made from a list of MP3 files so you can use it with your iPod/MP3/CD player or on your computer. 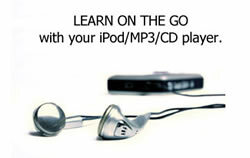 Convenience and Flexibility: Learn on the go Take your learning on the go AudioMate whenever and wherever you want. Just load your lists onto your MP3 player and you are ready to continue your learning while you travel, at the gym, or just on the go. Understand what you hear and speak naturally and correctly on a wide range of subjects. Mimic native speakers. 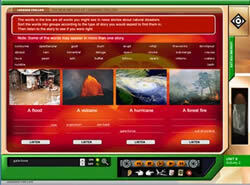 Listen and practice keywords, phrases, idioms, sentences, and conversations at different speeds.